Swachh Bharat Abhiyan on Nails! 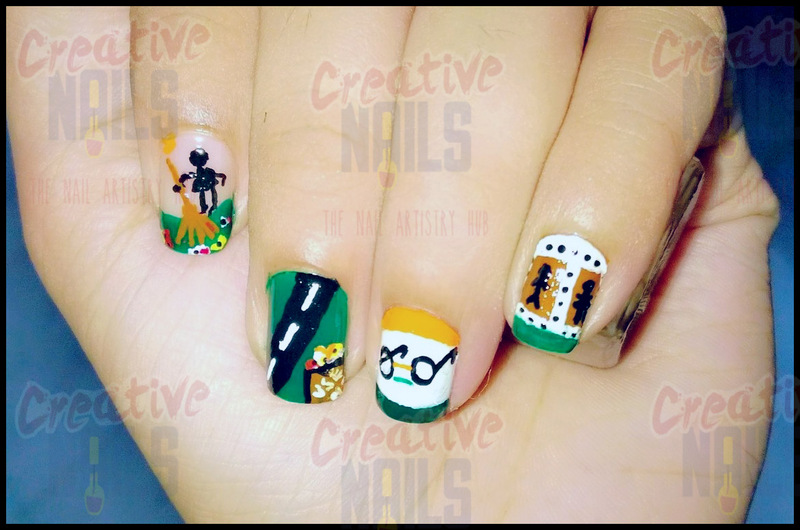 Today’s nail art is dedicated to our beloved Prime Minister Mr. Narendra Modi’s “Swachh Bharat Mission”. First of all, Creative Nails wishes to congratulate the Modi Government on the successful completion of 100 days of stable, policy-driven proactive governance. Friends, Modiji is a ray of hope for the Indian economy. But Modiji alone cannot make India a developed country. As citizens of India even we have to contribute towards achieving this goal! Let’s say you are going to your friend’s or relative’s house and you find that garbage is dumped in front of house. Would you even like to have a sip of water in that house? You will never like to visit that house again. Isn’t it? Will you like if the same reaction is shown towards India by other countries? Never ever will you like it!! So friends, stop throwing packets of chocolates, junk foods etc. on public property. Use toilets and help keep India clean!! Swachh Bharat, Shreshtha Bharat !! I am totally in love this mani. I agree with you 100% we all should own responsibility of keeping our surroundings clean. This is such a cute mani to spread the message!